Building a comprehensive search engine optimization strategy for your rehabilitation center can feel overwhelming. What’s your plan for handling technical SEO? How are you addressing potential patients in the awareness, consideration and sign-up phases of the buyer’s journey? How do you plan clean up questionable links and attract new links to boost SEO ratings? That’s where Wiideman Consulting Group comes in. We’ve been building SEO and PPC strategies for rehabs since 2009. Learn more below, or call us M-F 8-6 PST at (562) 732-4417 to schedule a free initial SEO Strategy consultation. The future of SEO is unpredictable, but what we do know is that for the short-term your customers will be searching for you primarily with their smartphones, and within a few years, using voice search. Our technical SEO strategy includes nearly 80 manually reviewed criteria Google has recommended and that we have ran experiments to test the value of. Focal points you’ll find in our SEO audit will include topics such as mobile page speed and accelerated mobile pages, URL handling and canonical URLs, duplicate content, broken links, caching, and many other factors that we know play a role in site-level SEO. The Wiideman Content Strategy begins with weeks of keyword research and taxonomy planning. We’ll be diving into historical keyword data in Google Analytics, Google AdWords, and Google Search Console. If we can build a data-driven keyword strategy, you’ll be optimizing for keywords that are more likely to improve sales, since it’s based off of keywords that are more likely to convert visitors into customers. Next, we’ll take a look at the top traffic-driving content of your competition, and aggregating thousands of keywords driving traffic to competing websites. When done, we’ll have build out a comprehensive customer-attracting content strategy, which in some cases may require a rebuild of the current information architecture of your website. Finally, our content analysts will explore questions and information queries that address the awareness phase of your customer’s journey. For a shoe manufacturer we support, this included keywords such as “how to clean white shoes”, for a storage franchise, “how to move and store your refrigerator”. When completed, you’ll have a full content marketing calendar based around highly searched for keywords that drive brand awareness and boost sales from remarketing and marketing automation campaigns. Google does not want you to build links meant to manipulate PageRank or keyword rankings. That doesn’t mean that we can’t create content that attracts links or work to remove less valuable links Google may be using to penalize rankings with. 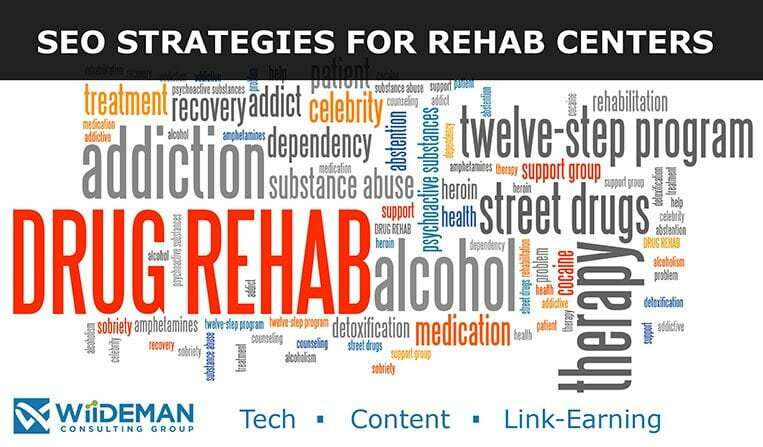 Order an SEO Strategy for Your Rehab Today! Call our office at (562) 732-4417 Monday-Friday 8am to 6pm PST, or use contact us online today. We offer a complimentary 1-hour strategy session for you and your team to get to know us and for us to better understand your SEO and PPC goals. Calls are always with a consultant, not with a salesperson. Give us a call today.